While Hamas has been violating international laws by denying visits or any communication with the Israelis it holds captive, Palestinian terrorists in Israeli prisons continue to enjoy basic rights, including meeting with an attorney, receiving medical treatment, religious rights, basic living conditions (such as hot water, showers and sanitation), proper ventilation and electric infrastructure. The families of the Palestinian terrorists held in Israeli prisons know where their sons are. They also know that their sons receive proper medical treatment and while away their days reading, exercising and watching TV. But the Israelis held by Hamas can only dream of seeing daylight as they languish in captivity. Hamas, the Palestinian terrorist group that rules the Gaza Strip, does not like a bill making its way through Israel's Knesset that would prevent visits by family members of terrorists in Israeli prisons. The bill, sponsored by MK Oren Hazan (Likud), would prevent such visits to terrorists who are members of groups that hold Israeli prisoners and deny them visits. The proposed Israeli law is a temporary measure, aimed at forcing Hamas to release information about the Israelis held in the Gaza Strip. There would be no need for the law were Hamas prepared to honor international and humanitarian conventions and allow visits by the Red Cross and other international agencies to the Israelis it is holding. In response, Hamas denounced Israel's proposed law as "racist," and said in a statement that it was a "flagrant violation of all laws and humanitarian conventions." Hamas spokesman Hazem Qassem claimed that the bill was "part of Israel's policy to impose restrictions on the prisoners." Suddenly, Hamas is concerned about "international law and humanitarian conventions"? Not quite. There is a catch. Hamas is only concerned about them when Palestinian terrorists are involved. As for the rights of Israelis held by Hamas, the Palestinian terrorist group apparently still believes they are not entitled to any rights. All Jews - not Orthodox or Reform, Conservative or Reconstructionist; ALL Jews. Not right wing or left wing; not liberal or conservative; not Democrat or Republican, Likud or Meretz. ALL Jews. Not Baby Boomers or Millennials, old or young; not Ashkenazi or Sephardic, European or African Jews; not white or black Jews; not American or Israeli. ALL Jews. Just like every single persecutor throughout our history. They never, ever, cared about the differences we attach to each other. Never saw any of us as better than the other. It never matters to them. They always saw us as Jews. JUST JEWS. All of us - Jews. That which unites us. Makes us who we are, makes us stronger. We are one people. We are ALL Jews. And tonight we mourn with the Jews of Pittsburgh and the Jewish families and the families of the police officers who came to their defense. We are ALL Jews. It could have been any one of us. So if it weren’t scary enough for the children to be told they have to go out and kill, PA educators teach them that “heroes” are willing to fearlessly die as martyrs. If you want to know why Palestinian children believe that killing Israelis is model behavior, all you have to do is look at a chapter in one of their schoolbooks. PA schoolbooks have been criticized ever since Palestinian Media Watch wrote the first report on them in 1998, and the newest books in some respects are the worst ever. However, one chapter stands out in its overt promotion of terrorism. This chapter, appearing in the fifth-grade Arabic Language book published in 2017, serves as a window to understanding the PA leadership’s profoundly twisted values. Until now this messaging is not problematic, however, all that changes when the schoolbook presents the 10 people who PA educators promote as the role models Palestinian children should emulate. The list of Palestinian heroes includes no scientists, no doctors, no engineers, no singers, no athletes, nor any artists. There have been three Muslim Nobel Prize laureates in science and two in literature, but they are not on the list of Palestinian heroes. Who are the Palestinian heroes then according to the PA schoolbook? They are 10 Muslim combatants from the first century of Islam through the 21st century. And possibly the worst name on this list of role models is terrorist mass-murderer Dalal Mughrabi. This cult-like worship of murderers is fundamental to the depraved value system that Palestinian leaders have promoted since the PLO’s founding in 1965, and upon which the PA has indoctrinated its children since 1994. It is not surprising that so many of the Palestinian terrorists in recent years have been teenagers, including the recent murderer of Israeli-American father of four, Ari Fuld. The Palestinian leadership has been transmitting its “kill an Israeli – be a hero” message for decades, and judging by the results, it is clear that Palestinian children have been listening. So these are the choices racing through the minds of Palestinian children who just studied one of the worst chapters in their schoolbooks: If I, Palestinian child, am willing to kill Israelis and be a martyr, then I will then be the best of the best, the crown of my nation, streets will be named after me and I will be a Palestinian hero; if I am not willing to kill Israelis and be a martyr, then I am a coward. If you were an impressionable child, which path would you choose? 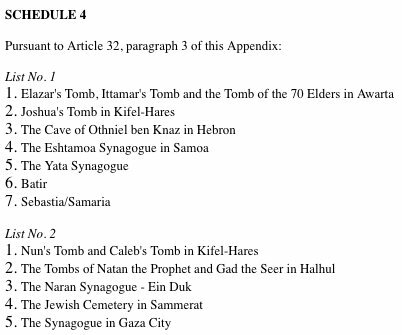 Under Oslo Agreements, PA obliged to ensure "free access" and worship - even bus stops - for 12 specified Jewish Holy Sites. Today, all remain completely unaccessible. Instead of free access & worship, they are just free of worship. Hello @UNESCO @UNHumanRights @hrw @AmnestyCIJ? This will be a “catch-up” posting to keep my readers in the loop during a process with regard to Hamas that is still unfolding. 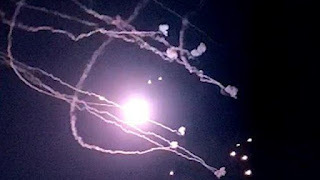 During the night on Wednesday, two rockets were launched from Gaza. Hamas later said their people did not launch them. But the IDF rejected this out of hand: The rockets were Grad rockets, a powerful weapon in the possession of Hamas in Gaza and none of the other factions. 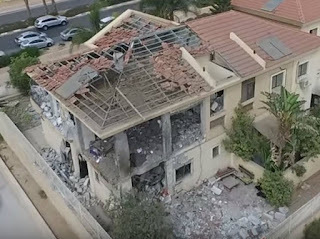 One rocket destroyed a house in Be’ersheva. A woman and her two children lived there. They had just entered their bomb shelter when the rocket hit. Hysterical at how razor-sharp close they had come to disaster, they had to be treated for shock. The other rocket was aimed towards Tel Aviv but missed its mark and I believe landed in the sea. This represented a major escalation from Hamas and generated a great deal of anger in Israel; Defense Minister Lieberman was especially incensed. 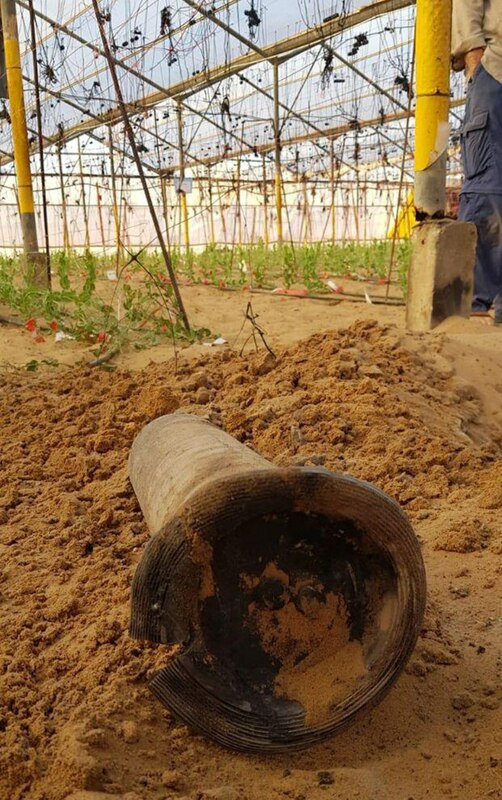 In response, the IDF hit 20 Hamas targets across Gaza; according to IDF spokesman Ronen Manelis, these included an attack tunnel, a Hamas base, and a rocket manufacturing site. In one instance, a group was struck as it was attempting to launch another rocket. During the day yesterday, there was still talk about last minute efforts by Egypt to redeem the situation before it was too late. A Security Cabinet meeting was delayed until very late because IDF Chief of Staff Gadi Eisenkot was in the US and had to return home. In preparation for that Cabinet meeting, Prime Minister Netanyahu held meetings with officers of the Gaza Division and other military personnel, as well as with heads of municipalities and regional councils in the area adjacent to Gaza. As time for the meeting approached, there were reports that it was Lieberman’s intention to seek approval of the Cabinet for a military action in Gaza, and so many of us went to sleep expecting to awake to news of war. This morning, however, all was quiet. Everything was even ordered back to normal in the southern communities. For a short interval of time it was so quiet that I thought that this might be a ploy: that a decision might have been made to reveal nothing to the press, and to then attack. But slowly, the leaks and comments began coming through: The Cabinet, it appears, opted for the position of Gadi Eisenkot (at left below, with Netanyahu and Lieberman), who recommended that the IDF respond according to what happens on the ground and not pro-actively. “I will not refer to the content of the cabinet discussions, but I can say one thing very explicitly - the rules of the game are about to change. "We will no longer accept the arson terror and the fence terror." Reportedly, the Cabinet has instructed the IDF to demonstrate a zero tolerance to violence at the fence, gradually intensifying the reaction to that violence. I am unable to be more specific as to what this means. Shooting any adult who launches an incendiary device? Killing anyone who tears down the fence and enters Israel? I do not know. It has not been specifically mentioned here, but I wonder about burning tires that spread toxic fumes into Israel communities adjacent to Gaza. Will that continue to be tolerated? The first test comes tomorrow, as the big day for rioting at the fence is Friday. You know what they do? They pray in the morning (it is their Sabbath), and riot in the afternoon and evening. Late this afternoon, a contingent of 60 tanks and armored personnel carriers, clearly visible from the main roads, were deployed along the Gaza fence. This is the largest deployment that has been observed since the Israeli-Hamas war in 2014. IF zero tolerance is actually exhibited, and IF Hamas knows we really mean business, then it is possible some measure of deterrence might be regained, and the violence might be contained for an interim of time. What the hell took so long? Why was there not a zero tolerance policy from the moment of the first violent confrontations at the fence six months ago?? Had there been an appropriately tough response from the beginning, we would not be contending with the current situation. A certain military reticence is admirable. But excessive reticence is deeply troubling. I have had direct communication with a soldier who just finished serving at the Gaza fence. I have heard first-hand about the frustration of the troops stationed there, and about the restrictive rules. My contact told me that the soldiers were often afraid to shoot because they might get in trouble for having done it the wrong way. Afraid? These are loyal soldiers, facing down violent, Israel-hating creeps, and trying to follow the rules. The situation has undermined their morale. And while our guys were being careful, those violent, Israel-hating creeps, supported by Hamas, have been sending incendiary devices into Israeli territory. “Over the past six months, since the outbreak of the arson attacks in the south, more than 1,100 fires have been caused in the forests of the Keren Kayemet Leyisrael Jewish National Fund, according to a just-released KKL-JNF report. I have been weeping inside about this for a long time, and I do not understand how it was permitted for so long!! Hopefully, the situation is about to change. One last comment: There is still talk about the possibility of a “long term truce.” I don’t believe it is possible. Lieberman indicated this week that every effort failed. More importantly, I absolutely do not believe that it should be given a chance to succeed. Who has ever heard of a ceasefire with a time limit? This is the Muslim version of a ceasefire, a hudna, modeled after the behavior of Mohammad. When there was talk of going to war now, Lieberman warned that it would be harder this time, because Hamas has better weapons. Should we then allow them to continue to increase the quality of their weapons, unhindered, for a period of years? Or until they decide they are strong enough to attack us? We must have the latitude to move as we deem necessary without being accused of “breaking” a truce. Zero tolerance is for the short term. Ultimately, it is going to be necessary to do a military action of a more extensive nature to, at the very least, diminish Hamas capabilities. And so we must pray. For the wisdom and courage of our leaders. For our own courage in hard times. And ultimately, for peace. Next week, Harvard University will be hosting the Israeli organization, Breaking the Silence, an organization funded by anti-Israel groups that incites against the State of Israel and defames the IDF. BTS members speak out against the IDF; they “testify” as former soldiers, but they do not tell the entire truth of situations– they distort the truth and they tell partial stories that provide a slanted and partial picture of reality. They do this to serve their only purpose: to slander and defame the State of Israel and the IDF. We have so many enemies all around us who want to destroy us and it is the most painful when this defamation comes from within us. BTS will be speaking before the students of Harvard University, one of the most prestigious institutions in the world – a stronghold of future leaders in every field. Many of its students will go in to hold key positions of power and influence. In speaking before the students there, BTS will be shaping the outlook of these future leaders against the State of Israel, against our country. I cannot be silent, I must break my silence. I served in the IDF during the Second Intifada. It was a difficult time. I also stood at checkpoints, stood guard, arrested people and fought in the Second Lebanon War. As an Israeli Arab and IDF solider in the Golani Brigade, I served together with other Israelis: Jews of all backgrounds, Druze and Bedouin. We were all equal, we were all brothers fighting side by side and I can testify that I served in the most humane and moral army in the world, with the highest code of ethics and human values. The IDF is an army that faces complex challenges and dilemmas in an explosive region, but it is an army that is level headed and always keeps as its ultimate highest value human life. The IDF is an army that will bend over backwards to save lives and to ensure that innocent individuals are not harmed, even if it means complicating the military operation. It is possible that there were incidents that did not live up to these standards, but these were the exceptions; they were not the norm and they were not the code by which the IDF is guided. They do not reflect the IDF nor the State of Israel. I am proud to have served under commanders who not only turned me into a better soldier but into a better person. One of the commanders who most impacted me was Israeli Major Roi Klein, who lost his life while trying to save the lives of his soldiers. During the Second Lebanese War, I was badly injured after I was hit by a cornet missile that was fired by Hezbollah. My fellow soldiers saved my life while under attack; they risked their own lives to save mine. After my injury, I received full medical care from the State of Israel until I was completely healed. I will not let BTS spread untruths and lies against my country. Two days after BTS takes it stand at Harvard University, I will be there to speak to the students with Reservists on Duty. The truth will prevail. The double execution-style murders last week of Kim Levengrond Yehezkel and Ziv Hajbi at the Barkan Industrial Park took place in the aftermath of the recent fatal stabbing of Ari Fuld in the Gush Etzion commercial center. In both cases, the Palestinian terrorists, ages 23 and 17 respectively, carried out their assaults not in “settlements,” but in two of 16 industrial and commercial zones in Judea and Samaria – the “West Bank” where Palestinians and Israelis live, work and shop. These young men murdered Israelis in order to resist a growing Palestinian middle-class cooperation and normalization, in which tens of thousands of Palestinian families have chosen to shape their future by cooperating with Israel and living and working with Israelis. Palestinian leaders and professionals living in towns and villages in areas C have expressed shame and sorrow quietly over terrorist acts such as these, as well as their inability to say so publicly. They have expressed disgust with their own corrupt and terror-supporting Palestinian Authority leaders who incentivize young Palestinians to murder Jews with more than $315 million annually, and whose official PA political and public culture and media incite them to murder Jews. While the Israeli security forces are still investigating the circumstances of the Barkan atrocity, one link already seems clear: Both young terrorists are bound by the fear and rejection that the bottom-up economic normalization has created an irreversible economically driven “revolution of interests,” as former PLO leader Hani al-Hassan put it. The painful paradox of growing Palestinian-Israeli economic normalization mixed with intolerable Palestinian assaults underscores the importance of Israeli sovereignty and security in Area C. It further exposes the deepening chasm between the PA and the terrorists they support and glorify on the one hand, with the silent and silenced majority of Palestinians who see their economic and political futures linked to Israel, as opposed to a failed, corrupt Palestinian Authority. As the standard of living for Palestinians has increased some 300% per wage-earner in Israeli-controlled, protected and administered area C, compared with the average annual salary in the Palestinian-controlled areas, the PLO and PA’s blood pressure increases. Some 100,000 Palestinians commute to work in “pre-1967 Israel” every day, while some 30,000 Palestinians work in the Israeli-administered area C of Judea and Samaria, which is also protected by Israeli Labor laws for both Palestinian and Israeli workers. Palestinains to seek a future with Israel and Israeli companies. SodaStream and Rami Levy serve as good examples of harmonious work cultures and advantaged compensation policies that are driving Palestinian employment, prosperity, career development and political normalization that all threaten the Palestinian leadership’s perpetual hold on power. In short, ongoing Palestinian terrorism has boomeranged against the Palestinian leadership. The silent Palestinian majority has linked its economic and political future to Israel and given up on its own leadership as an economic anchor and political solution. • in Gaza, tunnels posed a serious danger to the citizens of the border communities. Firstly with new detection methods, existing tunnels were located and destroyed. Secondly a wall which was sufficiently deep into the ground cut the chances of building new tunnels. • One of the latest problems that exists for many armies around the world are the improvised explosive devices (IED’s). Now a robot has been designed to save soldier’s lives from exploding IED’s. Israel Aerospace Industries has completed the development of an autonomous system that can identify, locate and destroy improvised explosive devices (IEDs) and mines before troops reach them, the company announced on Sunday. • When there is no alternative to boots on the ground governments around the world are quietly turning to YAMAM, Israel’s special police force, for help with their most intractable security problems. And now, elite commandos publicly reveal the tactics that have made it one of the most fearsome counter terrorism units in the world. including to refugee organizations. But why? How important is the Temple Mount? Ask Mahmoud Abbas. Elected leader in 2009, with no elections since then, of the Palestinian Authority that purports to be a state (but can’t even extend effectively its rule over Gaza). The media supporting the P.A. regularly employs purposeful terminology so as to distort and demonize Jews. One recent headline published during the Sukkot holiday reads: “Over 500 Israeli settlers storm Al-Aqsa.” Indeed, “storm” is their preferred word-of-choice, intimating that Jews as Jews should not be there at all, and that they are somehow breaking in illegally. Another referred to “religious rituals” as if they were witches from Macbeth. Interestingly, that section was not in the official WAFA version. By the way, Jews do not, indeed cannot, enter the Temple Mount compound daily, unlike prior to 2000. Almost 160 days in the year the Temple Mount are off-limits to Jewish visitors for various reasons. But that was but one part of Abbas’s litany of lies. In another version, we read of another land mass undefined: “On the land of the fathers and forefathers, the land of heavenly Messages … ,” but then deeper into the document, we read, “Its territory is an indivisible whole with its boundaries, as they existed on the eve of 4 June 1967.” And yet, Judea and Samaria were part of Jordan, illegally occupied and annexed, and Gaza was under Egyptian military rule. We also need not forget that the U.N.’s Resolution 242 does not mention Palestine as a state or other political entity. So, what is Abbas claiming? Quite simply, he is engaged in national-identity negation. A bit later on in his address, Abbas notes that the Arabs of Palestine are “an indigenous people and our roots are deep across 5,000 years.” Arab collective identity within the general area of historic Palestine is 1,380 years old. Arabs may have been engaged in commerce or pilgrimage before 638 C.E. (and prior to them assuming an Islamic ethos), but to claim a 5,000-year history, even as Canaanites or Jebusites or even Natufians are false, ridiculous and outlandish suggestions. What does Abbas mean when he said peace must include “an independent Palestinian state, with East Jerusalem as its capital, and not some place in East Jerusalem as its capital, and with all of its holy sites?” Do all holy sites refer to just Islamic sites? What about Christian or Jewish sites, and the claim that one cannot be Palestinian if one is Jewish? 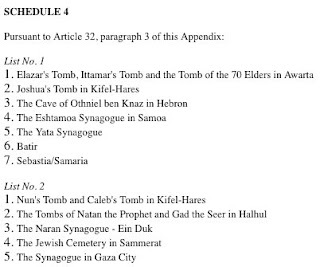 Of course, since Abbas and company promote a form of reconstructionism that suggests the Western Wall is actually the Al-Buraq tethering post, and outright denies of the 800-year existence of two Jewish Temples on the Temple Mount—despite their explicit mention in the Koran—perhaps Abbas really does disavow anything Jewish about Jerusalem. Incendiary kites, terror tunnels, sniper fire, tossing of grenades, IEDs, infiltration and more at the Gaza border occur almost daily, not to mention mortars, rockets and missiles. But Abbas knows that the United Nations is his playground, his theater. He can be elected, as he was just now, to the Group of 77 with impunity despite his words and his actions. And his stage is becoming increasingly immoral, malevolent and extremely hazardous, revealed by the applause Abbas received from that seemingly august, peace-loving body. It is that applause that assign to his appearances the tragicomic label.